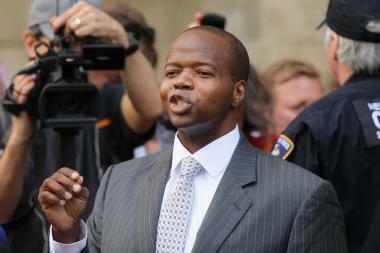 BROOKLYN — Brooklyn District Attorney Kenneth Thompson has paid a $15,000 fine for violating city ethics rules by using his NYPD bodyguards to buy him lunch, and then reimbursing them with taxpayer funds from his office. The hefty penalty from the city’s Conflicts of Interest Board, one of the largest ever, was announced Tuesday, revealing that Thompson routinely had officers on his security detail fetch food out of their own pockets during his first five months in office in 2014. They then put in for reimbursements from an office "petty cash" fund, according to a source close to Thompson, that totaled roughly $2,043. When the practice was questioned in May 2014, (it is not clear how it surfaced), Thompson amended his office “policy” to only accept office-funded food on weekends or nights when he worked, which ran up another $1,489. But even that streamlined approach to using taxpayer money for lunches violated city ethic rules. “From approximately January 2014 until May 2014, while I was working as district attorney, members of my security detail purchased weekday meals for me with personal funds,” Thompson said. “They requested and received reimbursement for these expenditures from the Kings County District Attorney’s Office with authorization from the KCDA’s fiscal office. “I later learned that this practice violated city rule,” Thompson said, adding that he has now reimbursed all the meals. In addition, the officers also laid out $1,992 for yet other meals they had to fetch for Thompson. Despite him paying back the money, the COIB slapped him with the $15,000 fine, which was nearly three times the cost of the lunches. In accepting the penalty, the highest law enforcement officer in Brooklyn acknowledged that he violated several codes including: using his post to obtain a personal financial benefit, and by engaging in financial transactions with subordinates (the police). Last year, the city's district attorneys lobbied for a 35 percent raise, which would have boosted their annual salary from $190,000 to $250,000. They ultimately received a $20,000 bump to $210,000, which remains well below the $500,000-a-year salary Thompson collected as a civil attorney before he was elected DA. By contrast, his predecessor, Charles Hynes, who faced criticism for the use of certain funds, was a regular at a coffee shop in his building, where he bought and paid for his own lunches. The COIB spokesman, Michelle Weinstat, said she could not comment beyond Thompson's settlement agreement.